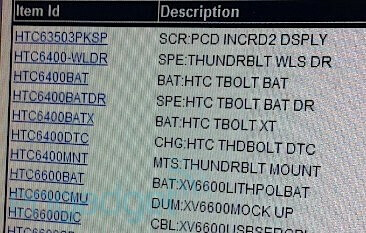 A leaked screenshot of Verizon's computer system reveals that the previously announced HTC Incredible S, a world phone sold only in the U.K., might be sold in the U.S. by Verizon as the HTC Droid Incredible 2. One screenshot shows a device with the model listed as HTC ADR6350. 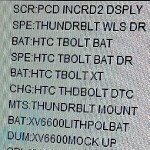 The other shot shows the HTC63503 listed as a display for the "INCRD2." While not a perfect match, a little bit of common sense can get you to the conclusion that a sequel is coming soon for Verizon's popular HTC Droid Incredible model. So while details are sketchy for now, it looks like the original HTC Droid Incredible is finally being put out to pasture while getting apparently replaced by a world phone. We earlier reported that the Droid Incredible 2 is expected to launch in this quarter and all signs point in that direction. Read between the lines folks. 63503PKSP, I just glanced at it and it looks like a sku for screen protectors. 6350(3pk=3 PACK) (SP= SCREEN PROTECTORS). Anyone from Verizon want to chime in and let us know if that's the normal sku for screen covers? Cause that's the way I read it, apparently not phone arena. do you guys atleast know what EHRPD means? based off all the skus we have i have never seen that in our system. so it has to be some sort of accessory. just cant think of what though... maybe some sort of dock? So essentially it's just going to be a beefed up Incredible? I kind of agree with Owlet how that could be confusing. I get that not every new phone NEEDS to run on our LTE network, but if I'm an average consumer I would probably assume that the successor to what was one of our flagship phones would have all of the latest specs- including 4G capable speeds. I'm wondering why they didn't just call the Thunderbolt the next phone in the Incredible line. This is really confusing. We need to know more about this thing! Maybe I don't want ThunderBolt?! maybe you should stop coveting android and start wanting a phone that works. Which one do I want that doesn't work? Mind enlightening me on that one?